Professor Jayashankar Telangana State Agricultural University Polytechnic Diploma Courses Admissions Results 2018 for admission in Agricultural Polytechnic, Seed Technology, Agricultural Engineering Polytechnic courses. 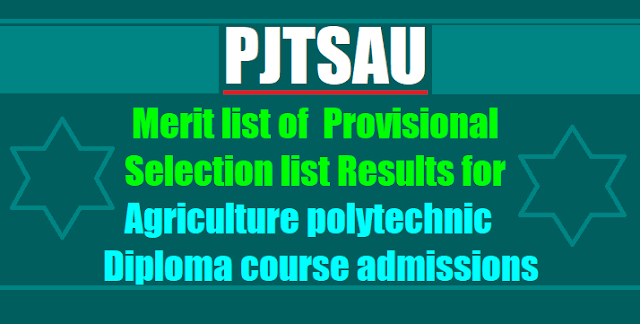 Telangana PJTSAU Polytechnic Admissions 2018: The Professor Jayashankar Telangana State Agricultural University (PJTSAU) published the Agricultural Polytechnic Admission Notification 2018 on 30-05-2018 and the PJTSAU invited the online applications from the eligible candidates for admission into two year duration Agricultural, Seed Technology Polytechnic Diploma Courses and Three year Diploma in agriculture Engineering courses in Professor Jayashankar Telangana State Agricultural University (PJTSAU) and its affiliated recognized private Agriculture Polytechnic institutes for the academic year 2018-2018 . PJTSAU Agricultural Polytechnic Diploma Courses: Institution wise list of provisionally selected candidates for Diploma Courses 2018-19/Merit list of provisionally selected candidates for Diploma Courses AY 2018-19. Candidates should join allotted colleges on or before ...../07/2018. The list of provisionally selected candidates for admissions into various Diploma Courses for the year 2018-18. Based on the options exercised by the candidates and rules of reservation, the below mentioned candidates have been provisionally selected for admission into various Diploma Courses. The selected candidates are informed to report at the polytechnics mentioned against their names in the list on or before .....-07-2018 (4:00 PM) failing which, the admission shall stand cancelled. No correspondence shall be entertained in this regard. The candidates are informed to submit their Original Certificates at their respective polytechnics along with the required fees as mentioned in the prospectus. The Principals of the Polytechnics are informed to admit the candidates duly following the rules of admission without fail and collect the original certificates, prescribed fees and anti-ragging undertaking from the candidates.